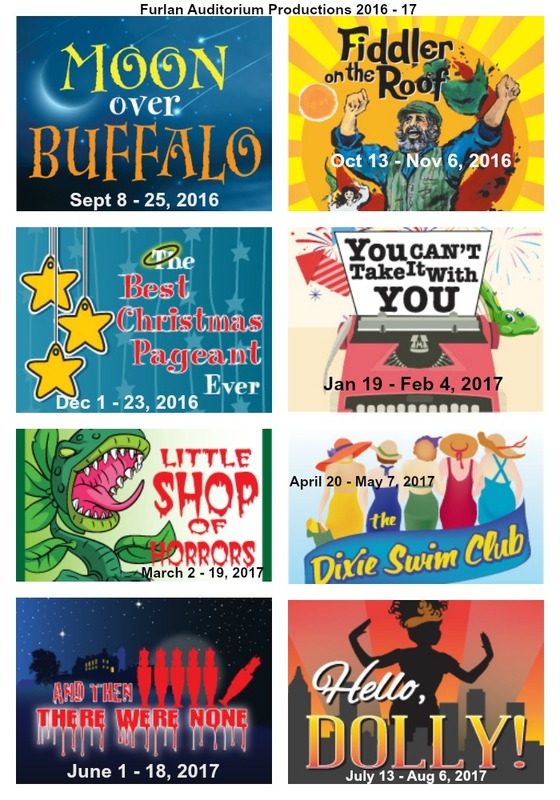 Sunset Playhouse recently held our 2016-17 Season Preview Party where we announced eight productions to be offered as part of its 2016-17 Furlan Auditorium Season, including hilarious comedies, edgy dramas, intriguing mysteries, and Broadway musicals. T he Furlan season begins in September with MOON OVER BUFFALO (directed by Michael Pocaro), a comical look at a couple of over-the-hill actors trying to keep their marriage and their ragtag touring company afloat. October will bring FIDDLER ON THE ROOF (directed by Diana Alioto), the beloved musical story of Tevye, Golde , their five daughters, and the colorful community of Anatevka. In December, THE BEST CHRISTMAS PAGEANT EVER (directed by Michael Pocaro) launches the holidays with a couple struggling to mount the annual church pageant while forced to cast a family of raucous, misbehaving bullies. YOU CAN’T TAKE IT WITH YOU (directed by Brian Zelinski), a classic screwball comedy in which everything that can go wrong absolutely does, kicks off the new year. March will find us in that LITTLE SHOP OF HORRORS (directed by Tommy Lueck), with its meek floral assistant, Seymour Krelborn, stumbling across a new breed of plant which can only survive on human blood. Then we’ll meet five southern women, whose friendships began many years ago on their college swim team. A heartwarming story of love and laughter, THE DIXIE SWIM CLUB will be directed by Dustin Martin. AND THEN THERE WERE NONE (directed by Carol Dolphin), is the mystery that keeps on giving as eight dinner party guests meet their demise one by one. The Furlan 2016-17 season wraps up in a big, boisterous way with the musical HELLO, DOLLY! (directed by Tom Weissgerber). This turn-of-the-century New York City story of matchmaker Dolly Levi, features a memorable, Tony-Award winning Jerry Herman score. 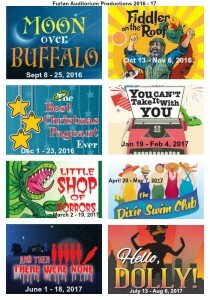 Season tickets for the 2016-17 season at Sunset Playhouse are now on sale, both Full Package and the Pick & Choose Flexible Package. Individual tickets will go on sale July 5, 2016.